Walk around the streets of Madurai for just a little while, and it becomes absolutely clear just how popular jigarthanda is in the city. Every nook and corner has a jigarthanda shop, some boasting of ‘unique taste’. Some shops have locals and tourists alike milling around, while some are empty. As we take this all in, the husband and I decide to try out the jigarthanda at a few different places. What is this jigarthanda, you ask? It is a drink made of milk and badam pisin, flavoured with either rose syrup or sarsaparilla (nannari) extract, served with a scoop of locally made, fresh ice cream. Sometimes, it also comes topped with tutti-frooti or dry fruits. It is the South Indian version of falooda, if you may. The name of the drink literally translates to ‘heart cooler’ (‘jigar‘ means ‘Heart’ in Hindi, while ‘thanda‘ means ‘Cool’). The drink is actually supposed to possess great health benefits, is believed to help cool down body heat and aid in the healing of several ailments – all this while being pleasing to the tongue. But what is a drink with a name like ‘jigarthanda‘ doing in a typically South Indian temple town like Madurai? Where did it come from? No one knows for sure. Some believe that the drink was made popular by the Mughal rulers, that its popularity trickled down South, and it found a home in Madurai. Some others believe that Muslim settlers from Hyderabad brought the drink to Madurai in the 1700s. Some believe that it was a Muslim ice cream maker in Madurai who first invented this drink. Such legends about the origin of the jigarthanda are many, but there seems to be no doubt about one thing – Madurai is the best place to have this drink. Today, Madurai is almost synonymous with jigarthanda, in spite of the drink being available at quite a few places across South India. Let me tell you about the few places in Madurai that we chose to try out the jil jil jigarthanda, as the locals call it. We discovered Sasta’s on our first day in Madurai, walking around the famous Meenakshi Amman temple. The place seemed nice and clean and decent, so we asked for a glass of jigarthanda. The drink had a lovely taste here, and felt like manna to our parched throats. It was cool and milky, and had just the right amount of the sticky badam pisin in it. We particularly loved the malai ice cream that the drink came topped with. This jigarthanda was far, far, far better than the version I had once, at a street-side shop in Trichy. We had heard that the jigarthanda at the famous Murugan Idli Shop in Madurai was lovely, so that was where we headed to for our next sampling of the drink. We chose a ‘Special Jigarthanda‘ here. Sadly, though, this jigarthanda wasn’t the mind-blowing thing we had expected it to be. The taste was just okay, and there was way too much pisin and tutti-frooti in the drink for our liking. Probably, we should have just asked for a ‘regular’ version. Located on the busy East Marret Street in Madurai, the Famous Jigarthanda Shop is one of the oldest outlets in the city selling the drink. The jigarthanda here is believed to be the best in Madurai, and I am glad we managed to visit it – we were almost going to give it a miss, due to paucity of time. People say that Famous has been maintaining consistent quality and taste in its jigarthanda, ever since the shop came into existence in 1977. There’s only one item on the menu here – jigarthanda – and that is enough to attract people in droves. We visited the shop at about 11 AM on a weekend, and it was buzzing like a beehive! The jigarthanda here was simply awesome, truly the best out of all those we had tried thus far. Unlike other places, this jigarthanda had a lovely brown colour and a rich, beautiful taste to it. I hear Famous adds basundi – made using a secret recipe – to its jigarthanda, and that is what gives the drink its gorgeous colour and flavour. Some say Famous was the inventor of the jigarthanda, the shop that brought the drink to Madurai first of all. Whatever legends might say, this is, unarguably, one of the best jigarthanda I have ever had. Don’t miss this place, if you ever visit Madurai, I urge you! And that was the end of our jigarthanda sampling trail in Madurai, if you could call it that. Trying authentic jigarthanda in Madurai is now finally, officially crossed off my bucket list! Have you tried jigarthanda, ever? How did you like it? Which is the best place you have had this drink? 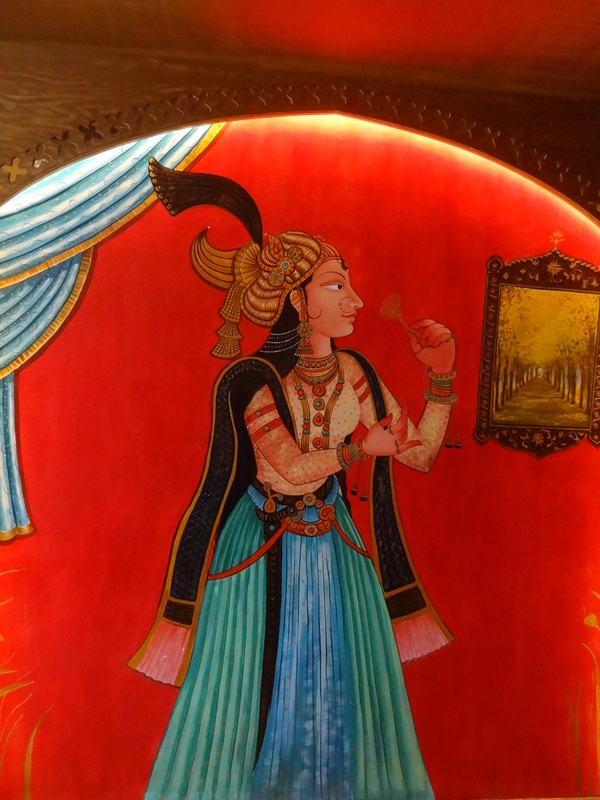 For my birthday this year, the husband and I decided to head to Chinita in Indiranagar for a Mexican lunch. This post is about our experience at the eatery. Chinita is a small place in Indiranagar, one among the multitude of restaurants that the locality boasts of. The eatery had been on my hit-list for quite some time, though, because of the rave reviews I had been hearing about the food here. We decided to head to Chinita because we wanted to try out the ‘authentic’ Mexican food that we heard that this place serves, vis a vis the fare at Mexican food chains like Taco Bell. The eatery wasn’t tough to locate. We went in just a bit before the lunch rush had started, so we got seats immediately. Very soon, the place got quite crowded (it was a weekend when we visited), and I hear weekends are always like that here. They don’t accept reservations over the weekends, so you just have to head down and try your luck, like we did. Chinita has a nice, relaxed vibe to it. It has the feel of a casual dining area, with its brick walls and wooden benches and tables. The small potted plants on each table charmed us, as did the arrangement of plants alongside the door. We also loved that the place is bright and airy, and not dull and dingy. Mexican music was playing in full swing while we visited and, with the lunch hour noise of patrons, it was tough to hold a conversation as we ate. I wish this could be rectified, though, I must say, the music was lively and energetic and beautiful – something I’d like to listen to. Like I said before Chinita serves Mexican fare, both vegetarian and non-vegetarian. First up, we asked for an Almond Horchata, a traditional Mexican non-alcoholic drink made of almond meal and rice. We were told that a horchata is not for everyone and that liking one needs an acquired taste, but we decided to go for one all the same. I took one sip and realised that it wasn’t for me. The husband loved it, and so the drink was duly given to him. I went for a Virgin Margarita, with fresh lime juice and pineapple. I loved this, and sipped on it through our meal. Then, we ordered an appetiser of Mexican-style grilled corn which is, apparently, all the rage on the streets of Mexico. The corn came beautifully done, with just the right amount of cheese and chilli powder smeared on it, served with wedges of lemon. Both the husband and I loved this dish to bits. Both of us would need one full plate of the appetiser for ourselves, though! Then, for the main course, we opted for Roasted Cauliflower Tacos which, we were told, wasn’t a part of the regular menu, but became quite popular with the patrons when the eatery served it at Christmas-time, resulting in them still making it. The tacos were good but, we felt, the stuffing lacked the ‘Wow!’ factor – it could have done with some more flavour. We also ordered a Sauteed Green Peppers And Onions Burrito, asking for it to be divided into two portions. Overall, we liked the burrito, but we felt, again, that the stuffing could have done with more flavour. It had too much rice in it, too. Good, but not great. The tacos weren’t very filling, but the burrito was. We had a little space in our tummies left by then, so we went for a Roasted Zucchini And Corn Burrito Bowl. Again, we felt that the dish was good, but not great because it lacked flavour. The dish was quite filling. We finished up our meal with some churros (how could we not?! ), served straight off the stove in a mug, with a liberal dosing of cinnamon sugar on them, along with a small cup of molten chocolate. The churros were just lovely, and both of us loved them. They were nice and crispy on the outside, soft on the inside – just perfect. The chocolate was so delicious I licked off every last bite of it! My first-ever tryst with churros – can you believe it? Service was quite fast, we felt. The staff was attentive, friendly and courteous, offering suggestions and enquiring whether we liked the food at every stage through the meal. Prices are on the higher side. We paid about INR 1600 for our meal, inclusive of taxes. 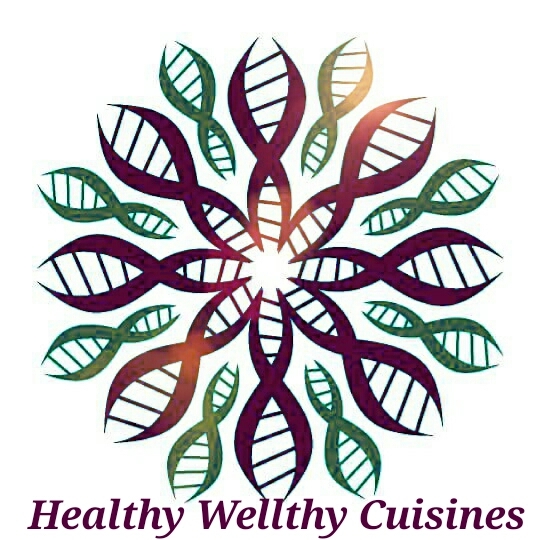 We loved the place and the service here, but our overall experience with the food was a little disappointing. Value for money, this meal didn’t feel like, sadly. Everything we ordered was very, very fresh. However, our taste buds probably need more of a punch than that, I think. I might go back to this place, maybe once, to try out their nachos, toastadas, enchiladas and guacamole, of which I’ve heard good things. Summer is slowly closing in on Bangalore, and the days are getting hotter. There’s still a nip in the air in the mornings, though, and sometimes in the evenings. I think I should tell you all about the winter-special raw turmeric pickle that I made about a month ago, before winter leaves us once and for all. Come Pongal, and bunches of raw turmeric start making an appearance in the markets of Bangalore. They play an important role in the Pongal celebrations, tied around the pot in which sakkarai pongal is cooked on the day of the festival. The turmeric makes for a beautiful pickle too, which is believed to generate heat in the body, much needed in the months of winter, and help internal wounds to heal. I make the raw turmeric pickle the traditional South Indian way, the way it has always been made in our family. I am sure there must be other ways of pickling raw turmeric, but this is the way we have always made it. Here is how we make the pickle. 1. Wash the turmeric roots thoroughly under running water, ensuring that they are completely free of dirt. Pat them dry using a cotton towel. Make sure no moisture remains on the roots. 2. Peel the turmeric and chop it into small pieces. 3. Take the chopped turmeric in a large mixing bowl. Add salt to taste, the slit green chillies, and lemon juice. Keep aside. 4. Heat the oil in a pan, and add the mustard seeds. Let them pop. Switch off the gas, and add the asafoetida. Let it stay in the hot oil for a second, then add all of the seasoning to the other ingredients in the mixing bowl. 5. Mix well. Let the pickle cool down completely, and then transfer it to a clean, dry bottle, preferably glass. 1. The pickle can be stored for 4-5 days at room temperature, slightly longer if refrigerated. 2. Always use a clean, dry spoon to take the pickle out of the bottle. 3. Store the pickle in a cool, dry place, out of direct sunlight. 4. This pickle has a rather strong taste of turmeric, so not everyone might like it. Also, one can eat this pickle only in small quantities, thanks to the strong taste. It makes for a wonderful accompaniment to curd rice. 5. To tone down the strong taste of turmeric, some people pickle it along with mango ginger and raw ginger. I prefer making the turmeric pickle separately, though. You like? How does your family pickle raw turmeric? A day before my birthday, recently, I decided to try my hands at making Bhapa Doi, the famed Bengali curd-based cheesecake, at home. I found a recipe that sounded too simple to be true. I had all the ingredients at hand, too. I gave it a shot, and the end result was so, so, so very gorgeous! A great birthday gift to myself, me thinks. I used the OPOS (One Pot One Shot) method to make the bhapa doi, using a pressure cooker. It needed just two ingredients, and was so easy to put together that even a child could do it. It unmoulded beautifully, and the taste was so lovely we couldn’t keep our hands off it. What more could you ask out of a dessert?! On the left is the bhapa doi, just out of the pressure cooker, ready to be cut. On the right is the bhapa doi that has been cut – can you see its gorgeous texture? This recipe is surely a keeper, I say. It is a life-saver when you have guests coming over and you need to whip up a quick dessert, or when you need a sweet pick-me-up yourself and are in no mood to labour for hours over the stove. You need to try this recipe out to believe it, honestly! Pour the sweetened condensed milk in a large mixing bowl. Add the curd to the mixing bowl. If you want to add any flavouring – like mango puree or cardamon powder or saffron – you must do so just after you add the curd. I didn’t use any flavouring agents, and yet, the bhapa doi tasted just awesome. Whisk the two ingredients well, until they are thoroughly combined. Grease a bowl with ghee or unsalted butter, and pour the mixture into it. Add about 1.5 cups water to a pressure cooker bottom, and set it on the gas. Put in the bowl. You could use a stand below the bowl to avoid water getting into it, or even cover the bowl. I left the bowl open. Close the pressure cooker and put the whistle on. Turn the flame down to medium. Let it cook for 15 minutes exactly, and then switch off the gas. Let the pressure release naturally, and then open the cooker. Gently drain out any water that might have entered the bowl. Slide the bhapa doi onto a serving plate. Turn the bowl upside down over a large serving plate, and the bhapa doi will slide onto it. (See the video that I have linked to, above, to understand this step better). Let cool slightly and then cut into pieces. You can serve it warm, cold or chilled in the refrigerator. You like? I hope you will try this out at home, and that you will love it just as much as we did! The term OPOS and One Pot One Shot are registered trademarks owned by Mr.Rama Krishna. This recipe has been obtained from the United By Food FB page. Imagine a cake that looks exactly like a drop of water. Cut into it, and you feel its lightness – it feels like you are cutting a drop of water. The taste too is exactly the same – just like a drop of water. That is Mizu Shingen Mochi, the Japanese dessert, for you. Popularly known as ‘Raindrop Cake’, Mizu Shingen Mochi is the brainchild of the Kinseiken Seika company of Japan. ‘Mizu‘, in Japanese, means ‘water’, and ‘Shingen Mochi‘ is a kind of rice cake that is popular all over Japan. Thus, ‘Mizu Shignen Mochi‘ literally translates to ‘water cake‘. Apparently, the company makes the cake using fresh water from the Japanese Alps, which is so sweet and tasty that the cake doesn’t need any other flavouring! How was my first tryst with the raindrop cake? When the raindrop cake arrived at our table, the husband and I ooh-ed and aah-ed over it. It looked exactly like a droplet of water on a leaf! This is a work of art all right! The cake felt and tasted exactly as I had imagined it to be. It felt like a drop of water on my tongue. The cake had no flavour of its own, deriving all its taste only from the mildly sweet powder and syrup it was served with, just as it is supposed to be. I understand that, traditionally, in Japan, the cake is served with kinako soyabean powder and brown sugar syrup. At My Cousin’s Place, too, I guess, the same two flavouring agents were offered along with the cake. The Japanese often add fresh or dried sakura blossoms to their raindrop cakes, I gather, which, of course, weren’t present in this Indian version. Considering that I have never sampled the original cake from Japan and have no benchmark to measure this dessert against, I will refrain from doing the same. Did I like it? Not really. The cake is, obviously, very different from the typical Indian and international desserts that we are used to, so it definitely possesses a novelty value. However, it didn’t satiate the huge sweet tooths that my husband and I possess. But still, this is something really, really cool – something that every foodie must try out at least once in their lifetime. Sampling this cake for the first ever time was, definitely, a dream come true for me, an experience I will cherish forever. For those of you who are interested, the cake is priced at INR 100 at My Cousin’s Place. You might want to enquire whether the cake is available before you visit, though. This cake makes it to the list of seemingly crazy food stuff we have tried out. Would you like to know about the other things on the list? Here you go! Ice cream sandwich and momo sizzler, Doodh cola, sea salt chocolate, chandan sherbet, momo burger and chocolate momo, ice cream rolls, ice cream chaat, bhoo chakra gadde, rasgulla chaat, chilli chocolate,fried ice cream, and paper sweet. 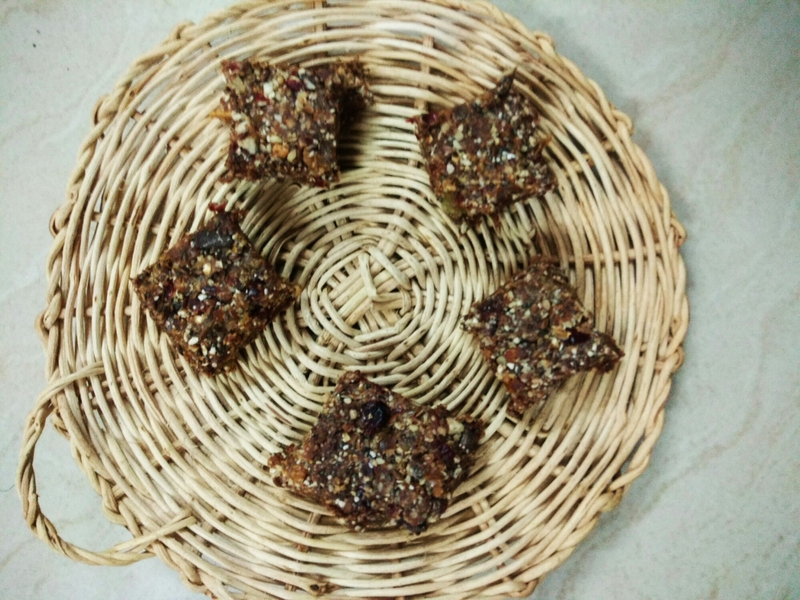 For a long time now, I have been thinking of trying my hands at making ‘energy bars’ at home. We aren’t big fans of any of the large number of energy bars available in shops now, but we do love Patanjali’s orange ones. We love buying a couple of them occasionally, for hogging in between meals. But then, home-made is always better, right? So, I set about hunting for recipes for home-made energy bars. Quite by chance, yesterday, I came across an interesting recipe on Instagram, at @cupcakeree. Incidentally, I had all the required ingredients at home, plus some more that I thought would be good to go in. I made the bars last night, a little Valentine’s Day treat for us, following the original recipe mostly, but making some variations of my own. The husband and I loved the end result. The bars turned out delicious, just the right amount of sweet, with a hint of sour and spice. 1. Heat up a pan and add the oats and mixed nuts. On medium heat, lightly dry roast these two ingredients, 3-4 minutes. Keep aside and allow to cool down completely. 2. In a large mixer jar, put in the roasted oats and nuts along with all the other ingredients. Pulse for a couple of seconds, then open the mixer and mix the ingredients well. Pulse again for another couple of seconds, then mix ingredients well. Do this till all the ingredients come together in a sort of coarse paste. 3. Pat down the mixture into the bottom of an air-tight box. 4. Store the box, closed, in the refrigerator (not freezer) for at least half an hour. The mixture will set within half an hour’s time, after which you can remove the box from the refrigerator and cut squares out of the mixture. 5. At this stage, if you want, you can roll the bars in dry coconut powder, sweetened cocoa powder, or colourful sprinkles. I didn’t do any of that – I decided to leave the bars plain. 6. Store in an air-tight box, refrigerated or at room temperature. 1. The candied ginger and sugared, dried golden berries were my own additions. Feel free to skip them if you don’t have them. The ginger does add a lovely flavour to the bars, though. 3. I am not sure if the dried cranberries had sugar in them, but the dried golden berries and candied ginger surely did. You could avoid these ingredients, plus the chocolate chips, if you want to make the energy bars completely free of refined sugars. You might want to increase the quantity of dates and raisins that you use, in that case. You like? I hope you will try this out too, and love it just as much as we did! The husband and I picked up a packet of peanut-and-jaggery polis on a whim, while visiting the New Mangalore Store on 19th Main, HSR Layout. They turned out super-duper delicious, so lovely that we couldn’t keep our hands off them! These are, apparently, a North Karnataka specialty, called Shenga Holige. They are just beautiful, I repeat. If you haven’t tried them out ever, I strongly urge you to. Price: A packet containing four holige is priced at INR 60. Biscuits with bits of toffee in them? Unique and interesting enough for me to want to try them out. I am glad I did, for they were just beautiful! I understand these biscuits are made in the Scottish Highlands, strictly adhering to a traditional recipe. Charming, right? We received these biscuits as part of a gift hamper from the husband’s workplace, but I know they are available at Food Hall, too. I understand they are also available on sites like Amazon India, Zopnow and Godrej Nature’s Basket. These biscuits make it to the list of crazy food stuff we have tried so far! Price: A 150-gram packet of these biscuits costs INR 299. While at the New Mangalore Store, we also picked up a packet of alphabet biscuits. It’s been ages since we saw these, so we couldn’t help but get all excited about them. The biscuits taste just lovely, and we enjoyed munching on them, just as much as we loved admiring them. Crispy, sweet and salty, we loved these! Price: A packet of these alphabet biscuits cost INR 40. You might also be interested in reading about the other seemingly crazy things we have tried out so far: Ice cream sandwich and momo sizzler, Doodh cola, sea salt chocolate, chandan sherbet, momo burger and chocolate momo, ice cream rolls, ice cream chaat, bhoo chakra gadde, rasgulla chaat, chilli chocolate,fried ice cream, and paper sweet. Valentine’s Day is just around the corner! If you are looking for something sweet, something simple, yet something classy to make for the occasion – if you are into that sort of thing, that is – your search ends here. This beautiful dessert is perfect, though, to brighten up just any day, Valentine’s or not. Here’s how you make these stuffed dates. 1. De-seed the dates and slit them on one side. If the dates are too big, cut them into half. 2. Put a few chopped walnuts along the bottom of each piece of date. 3. 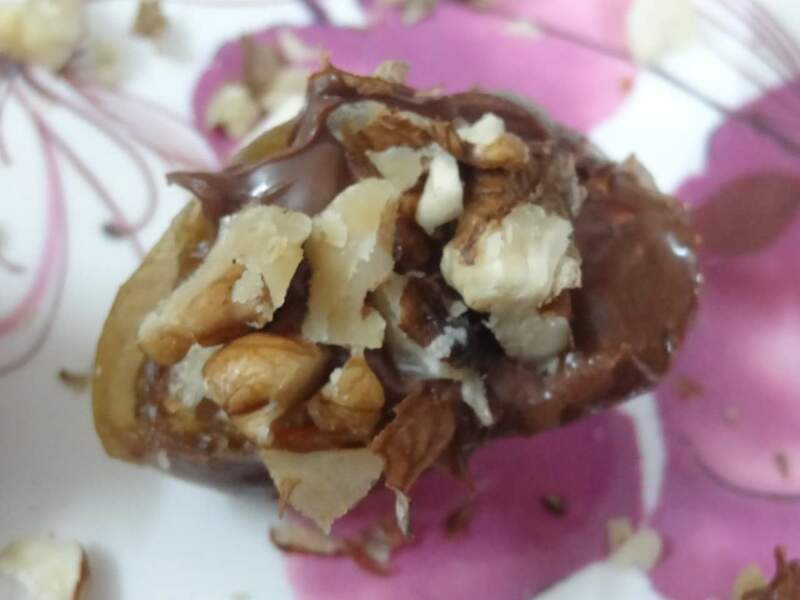 Carefully, spread a little Nutella on each piece of date, above the walnuts. 4. Decorate each piece with a few chopped almonds. 1. I find that walnuts and almonds go very well with this dessert but, really, you could use any kind of nuts that you have handy. 2. Grated chocolate, milk or dark, can also be used in place of Nutella. Come winter, and bajri na thepla start making an appearance in Gujarati households. With all the ginger, garlic and sesame that goes into them, these rotis are said to generate heat in the body, much needed in the winter months. They make for a hearty, filling meal, especially paired with a mustard-y carrot pickle, a blob of butter, or some curd and chopped onions. What’s more, these rotis travel well, too. If let to cool fully and packed in a clean, air-tight box, they keep well for upto five days. Any wonder, then, why Gujjus carry these theplas with them on long train journeys? Make them sans the sugar, and they make for one of the healthiest lunches you could ever have. You could reduce the quantity of oil you use in the theplas, too, if you want. I tried making these beauties at home, for the first ever time. I learnt how to, from our relatives, who are visiting from Ahmedabad. I absolutely had to, before the winter here completely comes to an end. I am happy to report that they turned out gorgeous – just perfect! Peel the ginger and chop it into small pieces. Chop the green chillies into small pieces. Peel the garlic cloves. Grind the ginger, green chillies and garlic to a paste in a mixer, using a little water. Keep this paste aside. Take the bajri atta, besan and whole wheat flour in a large mixing bowl. Add the salt to taste, turmeric powder, red chilli powder (if using), sugar, sesame seeds, 1/4 cup of oil, green chillies-garlic-ginger paste, chopped coriander, chopped fenugreek, and curd. Mix all the ingredients in the mixing bowl well. Bind into a firm but soft dough, adding a little water if necessary. Normally, you will be able to bind the dough even without using any water, thanks to the water content in many of the ingredients. Let the dough rest, covered, for about 15 minutes. Heat a thick dosa tava till drops of water dance on it. While the tava is heating up, take a small piece of the dough and pat it, using your hands, into as thin a roti as you can. If you are able to roll out the dough into a roti using a rolling pin, you could do that too. Place the roti on the hot tava and reduce the flame to medium. Spread a teaspoon of oil around the roti and let it cook on one side. Then, flip over the roti, and spread another teaspoon of oil on the cooked side. Let the other side cook thoroughly, and then transfer the roti to a plate. Make rotis out of all the dough, in a similar manner. Serve hot, with pickle, curd and chopped onions, or a pat of butter. You like? I hope you will try this out, too! A while ago, I was invited to be part of a bloggers’ table at Jalsa Gold, a new place in Kadubeesanahalli, near Marathahalli, Bangalore. I had a great time lunching here, along with a bunch of other food bloggers. This post is about my experience at Jalsa Gold. The place is located in the vicinity of several other popular eateries like The Boozy Griffin and Wok To Asia, as well as Cessna Business Park. It is quite easy to locate. 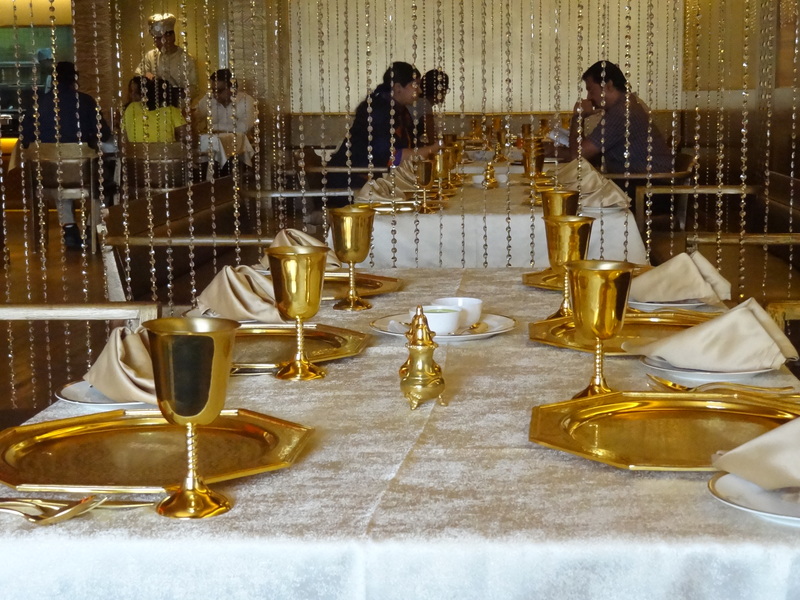 Jalsa Gold, as the name suggests, is a gold-themed restaurant. Everywhere you look here, it’s all gold, chandeliers and flower pots and tableware included. You cannot help but feel like you are royalty and are dining in your gilded palace. The service staff, dressed in period clothes, with turbans perched on their heads, only add to the effect. The ambience here is, without a doubt, grand and rich. Photo-ops here are aplenty. The old-time Hindi music playing at the eatery quite fits in with the Indian food that is their mainstay. 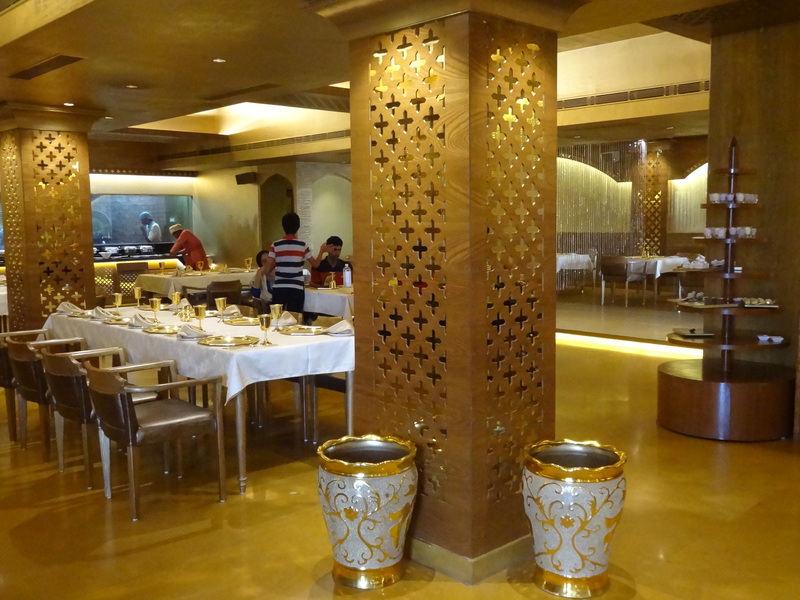 The eatery specialises in Indian fine dining, though its extensive menu includes quite a few fusion dishes. Like I said before, Jalsa Gold has an extensive menu, spanning vegetarian and non-vegetarian, Indian and fusion, starters, main course dishes and desserts. For the bloggers’ table, we were served the house specialities, saving us the trouble of choosing from the menu and allowing us to sit back, relax and focus fully on the food. The vegetarian starters that we were served included Popeye Ki Spinach Tikki, Peshawari Paneer Tikka & Malai Broccoli, Lal Mirch Ka Paneer Tikka, Coleslaw Rolls and Vegetable Tarts. The non-vegetarian starters included Chidiya Ka Ghosla, Murgh Kulfi Kabab, Mutton Seekh Kabab, and Chicken Swans. Lal Mirch Ka Paneer Tikka at Jalsa Gold, served in a belan! Every single one of the starters was presented beautifully. Some of these starters were served in a sort of belan and some on golden plates (in keeping with the theme of the restaurant). I particularly loved the presentation of the Chidiya Ka Ghosla (Oriental-style chicken served in a bird’s nest) and Chicken Swans. It was evident that a lot of thought had gone into the presentation. On the left: Chidiya Ka Ghosla, On the right: Chicken Swans. Cute, right? All of the non-vegetarian starters went on to be much loved. They were delicious, as per my fellow foodies. I tasted only the vegetarian food, though, and felt that the starters were okayish in terms of taste, not really great. The paneer in the Paneer Tikka & Malai Broccoli and Lal Mirch Ka Paneer Tikka was too chewy and not melt-in-the mouth soft. The other vegetarian starters, too, were lacking in flavour. I loved my Virgin Orange Mojito, and understand that the cocktails were much loved, too. Next, we were served Pizza Napoli (vegetarian), Chicken Tikka Pizza (non-vegetarian), Paneer Lababdar (vegetarian), Dal Makhani (vegetarian), Khada Masala Ki Murgh (non-vegetarian), and Gosht Nihari (non-vegetarian), along with Cheese Naan, Butter Naan and Tandoori Roti. I heard from my non-vegetarian foodie friends that the Chicken Tikka Pizza was nice, but that the Gosht Nihari was just okay. The Pizza Napoli was good, but didn’t had that ‘Wow!’ factor to it, I felt. The rotis and naans were good. I loved the Dal Makhani and the taste of the Paneer Lababdar, though the paneer was, again, a tad chewy. I heard that the Khada Masala Ki Murgh was nice, but not great. Then, we were served vegetarian and non-vegetarian biryani, the Lucknowi version. I loved the vegetarian biryani – the spice level, the texture, the taste, everything was just perfect! The raita was perfectly spiced, beautiful in taste. I hear the non-vegetarian biryani (chicken) wasn’t as great. Then came the desserts – a whole host of them, in fact – which had us awed with their presentation. I loved, loved, loved the presentation of the desserts! From left to right: Gulab Jamun With Rabdi and Malpua, Paan Pannacotta With Gulkand Sauce, and Chocolate Swans – just look at those swans, will you? I loved the Gulab Jamun With Rabdi And Malpua – the rabdi was outstandingly brilliant. The Chocolate Swans and Paan Pannacotta failed to win me over, though. I loved the pastries, as well as the American Cheesecake and the Mango Panacotta. We were also served a couple of other desserts – like Strawberry Panacotta and Caramel Custard – which were okayish. The prices here are on the higher side. An a la carte meal for two would cost about INR 1800. 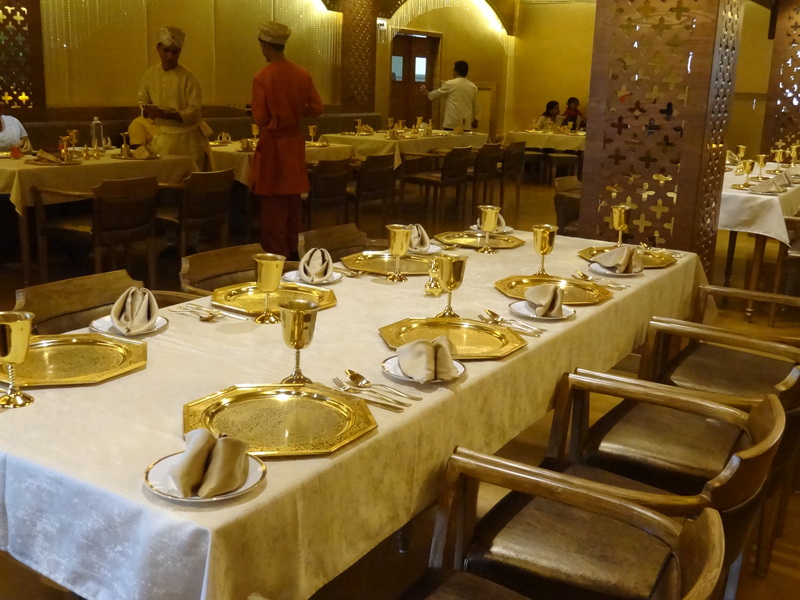 They also offer a variety of lunch- and dinner-time buffets, with prices ranging from INR 479 to INR 1599 per head. The ambience of the place is just awesome. A meal here would definitely be an experience worth savouring. I thought the eatery has a stronger foothold over Indian cuisine rather than fusion cuisine. Given a choice, I would opt for strictly Indian starters, main course and dessert here. I would suggest that you opt for one of the different buffets that they offer, rather than going the a la carte way. That way, you get to taste a whole lot more at a relatively lower price. Oh, and the buffet here is not the stand-in-a-queue-and-weigh-your-hands-down-with-heavy-plates kind of thing that is common in other eateries. Here, they serve you the buffet, while you sit down. Even the buffet which costs the least consists of about 50 items – so, definitely, a royal treat! This is definitely a place that I would love to go back to. We have sampled just a small part of the huge menu, after all. Like I said earlier, the starters we were served here didn’t impress me, but I liked the main course dishes and most desserts. The other (non-vegetarian) food bloggers with me loved the starters and desserts much more than the main course. I have a feeling I would have loved the starters too, had the eatery chosen strictly Indian ones to serve. We were served this meal free of cost, in exchange for an honest review. The views expressed herein are not influenced by anything or anyone. I do not stand to receive any sort of gain by recommending this eatery to you.